Yesterday was the vigil at Souroti in Thessaloniki. 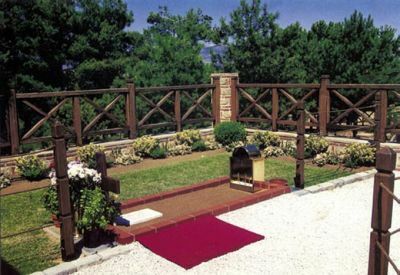 Hundreds of Orthodox pilgrims from Greece and abroad were found last night at the tomb of the blessed Elder Paisios, at the Monastery of St. John the Theologian and St. Arsenios, in Souroti of Thessaloniki, where the Elder was buried on July 12, 1994. The vigil was followed by young and old, children and adolescents, regardless of the unbearable heat that prevailed at that time in the region. "Around four hours I waited to venerate the tomb of the Elder ... Every time I come it helps me a lot ... Now that everyone has so many problems, we take strength from our faith", says Helen K. from Florina. The entrepreneur Natalia Pascal, along with her 25 year old daughter Alina, came on pilgrimage from Kiev, Ukraine. "In Russia and Ukraine Paisios is a beloved father of the Orthodox Church. Books devoted to his works and prophecies have been translated into the Russian language", said Natalia to ΑΜΠΕ. "If more people visited the monasteries and had a spiritual relationship with the monks, many of the psychiatric hospitals would be closed", Elder Paisios once said of Mount Athos. "Today the Monastery of St. John the Theologian, where he is buried, acts as a 'spiritual hospital', a healing center and spiritual oasis in the desert of atheism, loss and madness, especially in the period in which we live", said Konstantinos P., and testified that his child was cured of a serious illness by the Elder. "From the parked cars alone I can see that this year we have four times the people visiting the monastery than last year", said the parking warden. "Very many young people came. It seems for the Greeks that there remains only hope and belief in Elder Paisios." Update from July 13th - People waited in line to venerate the grave of Elder Paisios till 6:00 AM this morning.